Marrakech, she of snake charmers, monkeys on ropes, mountains of figs and apricots, belly dancers and souks … all as imagined – narrow, colourful laneways, acres of slippers, impossible to know where you are or where you are going, alleyways full of motorcycles, bicycles, donkeys and greetings from every shop front. Smoke, dust and sunlight fractured onto brass, silver and copper by roofs made of wooden slats … and then a little square with sunlight and some stools around low tables perfect for a glass of mint tea? Luxurious Riads in the Kasbah beside smoking sidewalk grills, bakery goods drenched in honey, coffee houses with bare light bulbs where men watch football at melamine tables and donkey carts trundle past the door. We overnight at the beautiful Riad La Sultana and venture to the “square” for dinner, wonderful grilled everything and spicy everything else. Retire to tourist roof top for a drink, alcohol is not freely available. 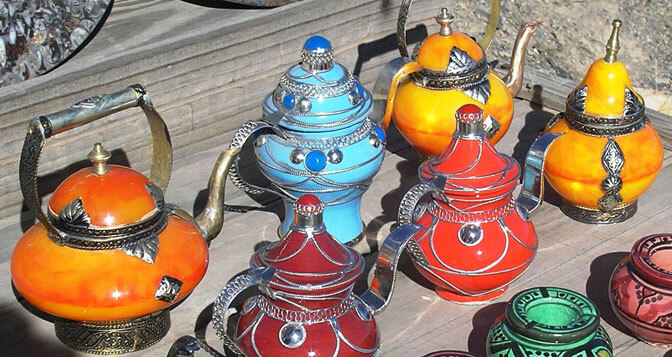 We head into the mountains of the High Atlas and Tizi n’Tichka pass, over 7400 feet at the summit, Berber boys waving rainbow coloured teapots while balanced on the precipice. 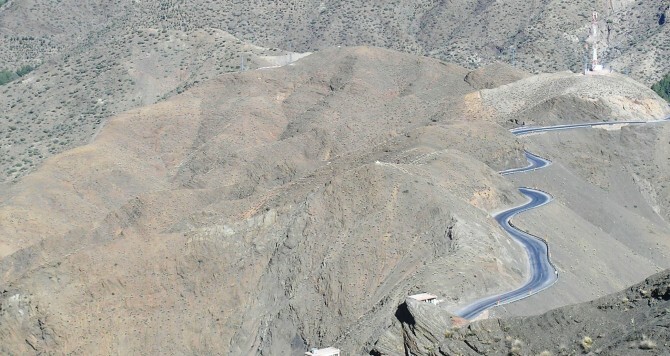 Cindy is lying down, cannot watch the hairpins and drop-offs, driver Yousef is calm and capable and bobs to Berber songs. The air is crisp and desert clear, cool, calming. We come across the first sign of Aid al’Adha, (The Feast of Sacrifice which celebrates the end of the Hajj), a bleating sheep draped over moped bikers shoulder, a little further on a half dozen sheep tethering roadside with fierce bargaining going on. 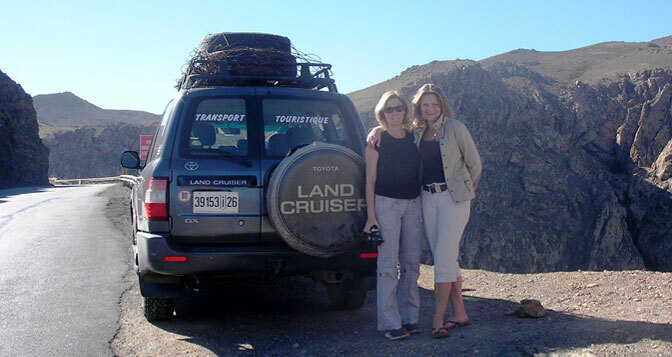 Keep travelling with bobbing Yousef to the palmerie of Skoura and lunch roadside on olives in lemon oil and hot bread. Afternoon shadows fall early on the red soiled Kasbahs of the Dades Valley on impossibly narrow road. Yousef unloads us at prearranged pension and disappears promising breakfast time return. We shower without soap and put on all the clothes we have with us in the high cold mountains, fireside dinner and sleep. Post breakfast we continue to the 1000 ft pink-walled Todra Gorge, I am lying down this time as I feel like the gorge is going to collapse on top of us. We have a memorable coffee beside a crystal river near the gorge and hike the back valleys. Return to Boumaine Dades late, dark, (Cindy won’t get out of the car this time), I go to confront the tallest Berber hotelier ever encountered, dressed in acres of blue robes and turban. Shows us room with woman’s balcony, screened so as not be seen from the street. We shower – with soap this time – and there is heating. Pillow lounging dinner fantastic, we are the only foreigners in town, drummers, a local wedding and the best pancakes and honey for breakfast. Best night of the trip. The last lucky sheep for Feast of the Sacrifice is spotted on the way past the bus station this morning, luggage compartment open, sheep has all four legs rigid against the side of the bus, four robed men putting shoulders to the job, bus is going to Casablanca 6 hours over the mountains. We continue back to the Berber village of Imlil, towered over by Mount Toubkal, sunshine patio and lunch of lamb tagine and figs. Overnight at the Kasbah Tamadot, soap, heating, butler, room service and minibar. Actually this is the best night of the trip. 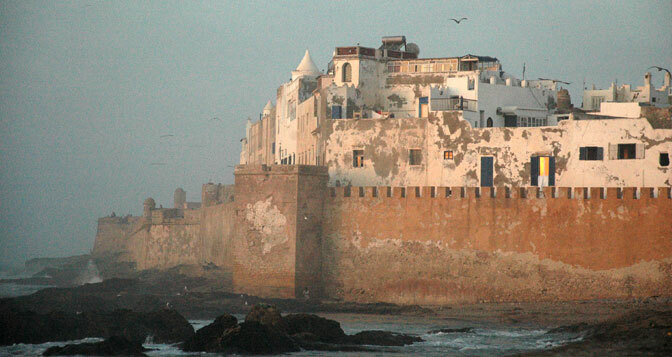 Down to the coast and the village of Essaouira with it’s’ fishermen, blue boats jammed into small harbours, giant waves and ancient sea walls. A wonderful, quiet respite from the world. Lunch in the fish market and the little man with tray of sweet cakes – I must buy half a dozen. He tells me I can have any except those in top left corner of tray, I insist on top left, of course, he says “No Madam – is happy cake”. He thinks I am either too old or too happy already for a little lunch time hashish. Dinner with Swiss argan king Uly on terrace of Taros. Feels like one of those places hippies go to watch the sun set, magicians doing tricks and expats with Berber business and alternative lifestyles holding up the open air bar. There are always choices. 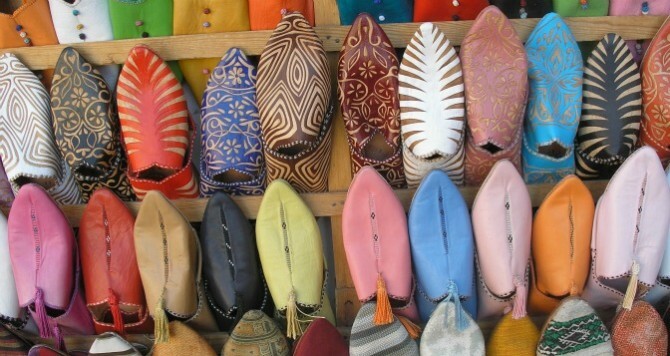 Marrakech and home tomorrow… no more tented Berber camps, Kasbahs and markets where shrouded women shop for dates and impossibly sweet oranges… Morocco only a 7 hour flight but another world.